JM Cellars is a family-owned winery in Woodinville, Washington focused on producing handcrafted, limited-release wine since 1998. John Bigelow and the winemaking team work with a diverse selection of Washington’s premium vineyards, crafting superior quality wines styled for balance, power, dimension and finesse. Small production lots allow the team the pleasure of producing a diverse wine selection while still focusing on high quality standards. JM Cellars values and implements environmentally sound practices. Margaret’s Vineyard is certified Salmon Safe and sustainable while Bramble Bump is organically gardened. 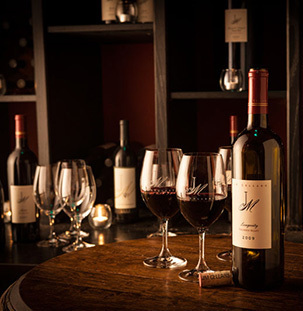 JM Cellars wine is sold in the Woodinville tasting room, on the website, and at select wine retailers and restaurants. JM Cellars is our family’s labor of love. We take our winemaking seriously, but have pledged never to forget why we came to Bramble Bump in the first place: to love what we do and to share that passion with others. The greatest gift from JM is the treasured relationships we have found. Thank you!